New World Makati Hotel presents A Taste of Norway, a culinary offering at Café 1228, the hotel's all-day dining restaurant. From May 2-20, 2016, guests can enjoy Norwegian dishes prepared by Guest Chef Markus Dybwad using only the freshest and finest seafood from Norway. In addition to your all-time favorites at Café 1228, the buffet spread will also include Norwegian dishes from appetizers to mains and to dessert. Just look for food labels with the Norwegian flag (see image above). During our visit at Café 1228, we were able to sample some of the dishes which guests can expect during this Norwegian food promotion. For appetizer, we had an assortment of Gravlaks, a Scandinavian dish made of raw salmon cured in salt, sugar, dill and other spices, sliced and usually served on rye bread. Some variants may have a sauce glazing on top. Gravlaks may also be made using other types of fish instead of salmon. Another appetizer served was the Snow Crab with Yolk and Dill. Split snow crab claws are pre-cooked and chilled, and are then topped with fresh egg yolk and dill, and served on a platter of shaved ice. Here is my plate of assorted Gravlaks, Snow Crab as well as other items from the appetizer station. Everything went well with white wine. Here's another crab dish served on our table. Split Norwegian Red King Crab legs were seasoned and grilled and served with lemon and parsley. The Grilled King Crab was very flavorful you would want it with rice or mashed potato. It's also hassle-free to eat this crab dish since the legs are already split. For the mains, we had the Charred Mackerel, Cucumber, Ponzu Vinaigrette. The charred skin of the mackerel gives a roasted flavor and crunchy contrast to the delicate flesh of the mackerel. You can taste the freshness of the fish from its natural sweetness that is clean to the palate. Don't forget to combine the fish with the sliced cucumber for extra crunch and refreshing aftertaste. 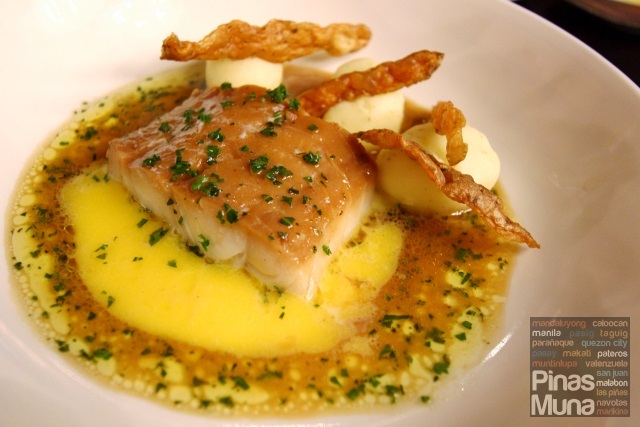 Another main dish served was the Smoked Haddock, Potatoes, Egg Yolk. The fish is salted and smoked to a consistency that is perfectly firm and moist. The yolk balances the saltiness of the fish. I recommend that you combine the fish with the mashed potato and soak them in the yolk. Don't let the flavorful goodness of this dish go to waste. Grab a bread and dip it into the heavenly broth. Meant to cleanse the palate after a flavorful meal, Parsley Granita was served in a cup made of ice and placed on a bed of parsley. It has a lightly sweet taste, with a hint of parsley, jicama and tanginess of jocote. Finally for dessert, we had a traditional Norwegian cake called Kvæfjordkake. It is a simple cake which originated from the town of Kvæfjord and is made with layers of meringue, vanilla cream and almonds. According to Chef Markus, it is a celebration cake which you can normally see in birthday parties. Other Norwegian desserts we tried were the Marzipan Cake and the Raspberry Jelly-White Chocolate Mousse Feuilletine. The international buffet at Café 1228 is available everyday for P1,999 per person for weekday lunch, P2,299 per person for weekend lunch, and P2,399 per person for dinner daily. For reservations, you can call (02) 811-6888. A Taste of Norway is made possible in partnership with Snorre Food, a leading supplier of premium Norwegian cold water seafood in Asia.